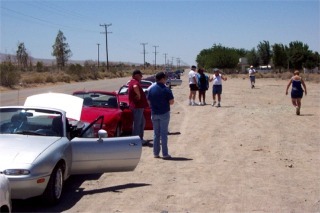 We led a tour on Route 66 between the Victorville route 66 museum and the Barstow Route 66 museum. There were about 35 cars. These are some of the sights along the way. We also put together a 4 page driving brochure for the tour that we donated to the Museums. When Burden’s Store and Post Office was built in 1926 the highway had just been graded by the state. 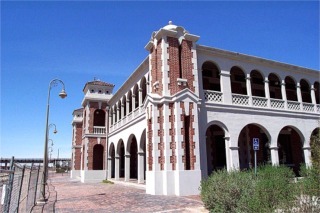 It burned the same year it was built and then it was re-built using bricks. Those bricks have become quite popular for tagger art. La Delta This is near Robinson Road and is now a private residence. 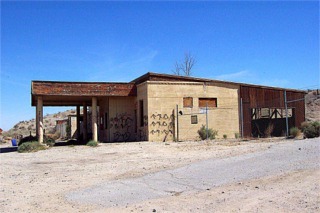 This building was originally named Pinky’s Service Station, and the owner was the Oro Grand town constable named Theodore Simon “Pinky” Ruiz. By July 1931 Mr. Ruiz sold it to Mr. & Mrs. Alva Dickens who decided to remodel it and build several cabins for the tourist travel. By October 1932 Mr. & Mrs. Dickens moved, and they left their legacy in the name La Delta. Mr. & Mrs. Casson, the next owners, sold it to Mr. & Mrs. Burge. Mr. Burge, a former Greyhound Bus Company employee and his wife, who was missing one leg, began operating a way-stop in August 1937 where they served short orders and all kinds of drinks, but not beer, yet. When someone wanted to catch the bus, Mrs. Burge would hang a red bandana on a nail to flag down the bus. 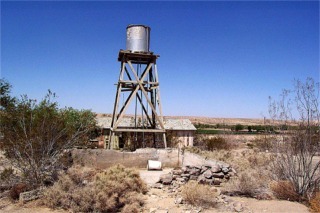 This picture is part of a reservoir along with a water tower that can be seen from Route 66. 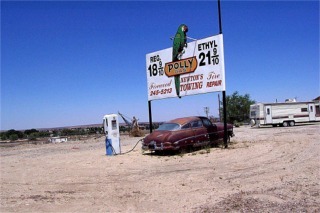 Polly Gas sign. When the interstates opened and the traffic on 66 dried up so did many businesses. This sign was left just as it was in the 1950's when the service station closed up. The Sagebrush Inn was a true roadhouse because it was established beyond city limits, which allowed it to take advantage of the milder laws on alcoholic beverages. George and Elizabeth Sibert moved into their home in May 1931. Their business began with a service station and by October 1934 George built an addition onto his Sagebrush Service Station. The addition included a bar/café and dance floor, plus a small storage area. A reporter for the local paper wrote about the grand opening and referred to it as the Sage Brush Inn, and from that point on, that’s what it was known as. Rumors abounded that the place was a brothel. There does not seem to be any evidence of that. However, it is generally accepted that Bessie was very protective of the younger woman waitresses, but if the older ones wanted to earn a few extra dollars on the side, she was not going to stand in their way. 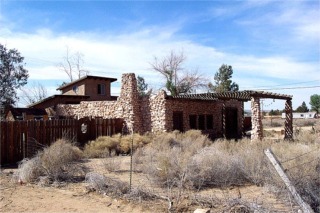 Another shot of the Harvey House in Barstow. The building just seems so photogenic I love it. Of course I had to show a picture with the cars in it. We broke up into 2 groups and Karen led one and I led the other.